FROM LEFT: Tanya Barton, Chris Taylor, Martin Sanks and Whitney Huskey. Anight at the theater typically doesn't come with a recommendation that you may want to wear a rain poncho, but Evil Dead: The Musical isn't your typical production. After all, not many plays are adapted from cult classic B-grade horror movies from the early 1980s. And, of course, most shows don't fire blood at their audience. Since debuting in Toronto back in 2003, the campy-to-the-max production has popped up at community playhouses around the country and has also played regularly in Las Vegas. Through Nov. 15, it's at the Spokane Civic Theatre, where shows early in the run have seen devout fans of Sam Raimi's source material line up early for the show, even wearing white T-shirts on which to capture the ample blood splatterings. Troy Nickerson, who directs the musical along with Heather McHenry-Kroetch, had never actually seen the Evil Dead movie until the Civic hired him on for this project. But he'd just come off directing the emotionally heavy Equus at Stage Left Theater, and figured he could use the levity of Evil Dead's story of teens in the woods who encounter demonic forces. "We're really honoring the B-movie feel and the acting is really campy, but intentionally campy," says Nickerson. "I definitely have camp in me. I think it's really fun to go as far as you want to go. It was a blast to put this together." The Halloween-timed play features Martin Sanks, a veteran of Civic musicals, playing Ash, the macho, chainsaw-for-an-arm character immortalized by Bruce Campbell in Evil Dead and the two film sequels that followed. While the Ash character has been around for 34 years, the persona is very much top of mind in 2015, with the recent debut of the Starz series Ash vs. Evil Dead, which features Campbell strapping on the chainsaw after all these years to slay some monsters. 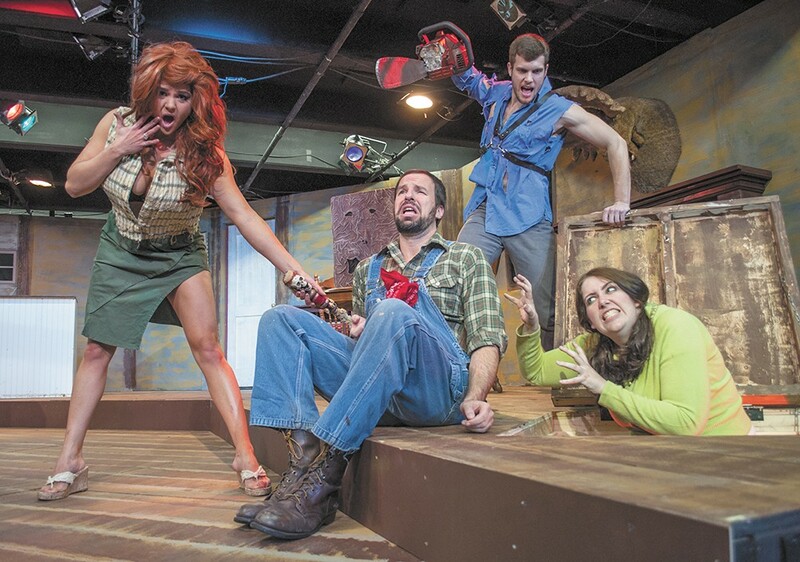 Evil Dead: The Musical shows that you can turn anything into a musical. You could call these fans a cult audience, but with the popularity of the TV series and steady sold-out shows of the musical at the Civic and other theaters across the continent, there's an argument to be made that Evil Dead is somehow mainstream. That's something Nickerson quickly realized when he took on the project. "The audience has a name that they're familiar with, so that definitely helps sell tickets," says Nickerson. He adds that Evil Dead stands alone as a musical, even in a time when it seems like just about any movie, book, board game, or superhero (ahem, Spider-Man) is getting a Broadway treatment. "Evidently, you can turn anything into a musical, but I like this because it's not a jukebox musical where they're just putting a bunch of hit songs together," he says. "The music was written well and moves the story along." Just a quick sampling of song titles — performed at the Civic with the backing of a three-piece rock band — in the production should give you a taste of what to expect: "Evil Trees," "What the F--- Was That?" and "Bit Part Demon." Nickerson gives props to Amy Calkins and her makeup crew for turning the teen characters into their zombified versions. Also, Evil Dead requires more technical aspects than most productions, including the "blood cannons" that launch gore upon the audience during more violent scenes. How much blood can you expect?